IFB = Integral Front Bearing : Also commonly known as a 5th Bearing. A bearing mounted on the propeller end of a Corvair conversion engine to help support and absorb loads on the engine caused by the propeller. 1. The Crankshaft becomes a one piece unit. Once the propeller hub is installed onto the crankshaft it is treated as one unit. This includes grinding, nitriding, polishing and installation. This eliminates the need for safety shafts and hub bolts. As a consequence it is a lighter assembly. 2. The thrust flange that carries propeller thrust loads is now located at the front of the engine, not at the rear. It is also larger in size. 3. The main bearing and seal are locally available at auto parts stores for replacement purposes and come in a variety of sizes. 4. The robust front housing is able to carry a very high load compared to any other 5th bearing design currently on the market. We will be able to use constant speed propellers on this design. 5. This design also allows us to extend the propeller forward slightly to allow for improved cooling and lower cowling drag. 6. Because of simplicity it's cost is very reasonable and actually less than others on the market. As far as Cons.. They are relitively minor but are of importance to the dependability of the final product. 1. Has to be initially assembled in-house. Because of the nature of the front housing, it needs to be bore aligned to the case in-house. Afterwards, the case can always be dissassembled and bearings changed without disturbing the alignment. It is a simple and low cost procedure. We typically have shortblocks ready to go. 2. This may be a negative to those who have front starter setups. The IFB will only work with our rear alternator and starter setup. However, this allows the use of a 32 amp alternator and a starter setup that is easy to maintain due to off the shelf starter and ring gear. (SEE IRA) That is a PRO! 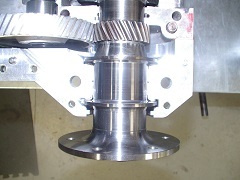 Crankshaft with CNC'd Hub installed and reground. 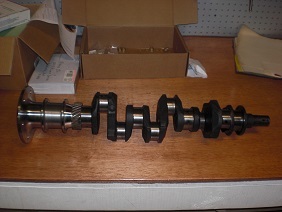 We use existing forged corvair crankshaft that have been magnafluxed, and inspected to begine this process. We also have brand new counterweighted crankshafts available in a stock and stroker version depending on horsepower requirements. Case with housing attached and crankshaft. The stock corvair case has been cleaned and fitted for the IFB housing. We can paint the case and other parts to your requirements. A finished short-block all torqued and ready to ship. It includes the rebuilt case, crankshaft, a new camshaft and gear, plus all new bearings. A typical Shortblock assemble costs about $2600.00. Call about more information. Noteworthy: The prototype of this 5th bearing design we made is still flying today. It first saw service in 2007 and has hundreds of hours on that airframe. Since then there have been several aircraft in service that are flying with the IFB Conversion with no failures to date. Because of its design it can be maintained on the field with no need to return to Azalea Aviation. Due to its simplicity and cost effectiveness we decided some time ago that all our engines will come equipped with the IFB. 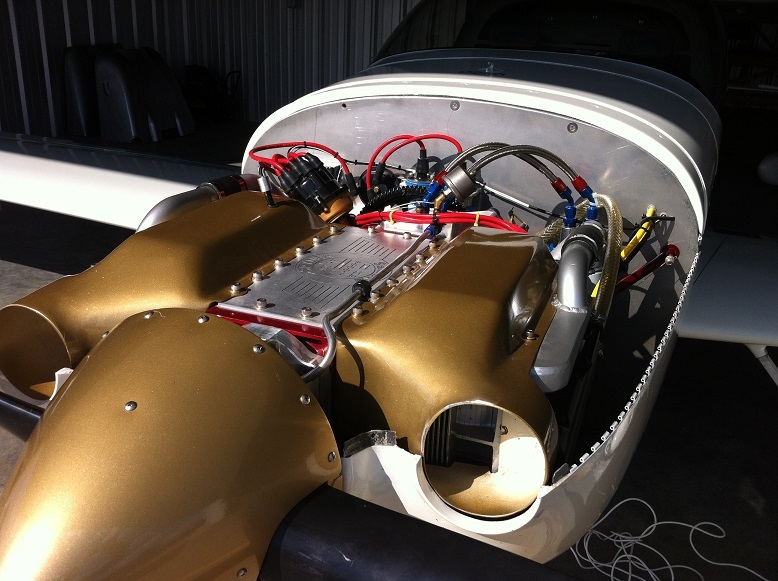 Picture of Our Spyder 100 HP IFB Corvair Conversion Engine installed on a Zenith 750 display. The IFB allows the use of our cooling plenums and makes a clean, simple installation possible. The IFB was designed and prototyped in 2008. The first flight engine with the IFB is still in service with several hundred hours on it. This design has been Patent Pending. We will protect our design rights. For more information about our IFB products or products in general please contact us directly at Azalea Aviation.